Proposer: Cardew Robinson. Seconder: Jan Harding. Mike was born in Batley, Yorkshire (a fact he will tell you within minutes of meeting) and he was a very funny man. He had an encyclopaedic knowledge of comedians. He knew their routines, their virtues and their triumphs. Mike was introduced to laughter at the age of six when he saw the great Albert Modley on the stage of his home town theatre, the Dewsbury Empire. By the time of his retirement he had become recognised as an authority on the 'Golden Age of Comedy'. 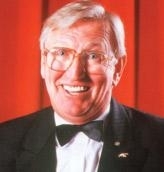 In 1988 Mike was given a Tribute Lunch by the Variety Club of Great Britain to mark his twenty-five years contribution to comedy. .His first play "The Day War Broke Out", the story of Robb Wilton had its premiere in Mike's home town in March 1998. Mike was very proud of his membership of the Grand Order of Water Rats; he was also a Lord's Taverner. He had two children, from his first marriage, Philip & Joanna, three step-children, Andrew, Eva & Dawn, and five grandchildren, Alex, Helen, Jenny, Lizzie-Dee and Mickey. He is survived by his children and his devoted wife Susan.